To build this hydroponic water culture system we used a 48 qt Sterilite storage tote (with lid) for the growing chamber. This is a good modular design, so you can easily scale it up or down to include as many growing chambers as you want. 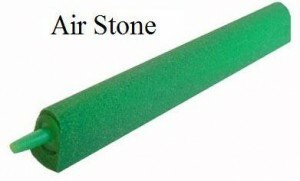 You will just want to make sure the air pump can supply each chamber with a good solid stream of air bubbles. If not, you can easily add more air pumps as needed. You can find inexpensive dual output air pumps at Wal-Mart for as little as $12, or single ou tput ones for as little as $7. For this setup we are using one dual output hydroponic pump. 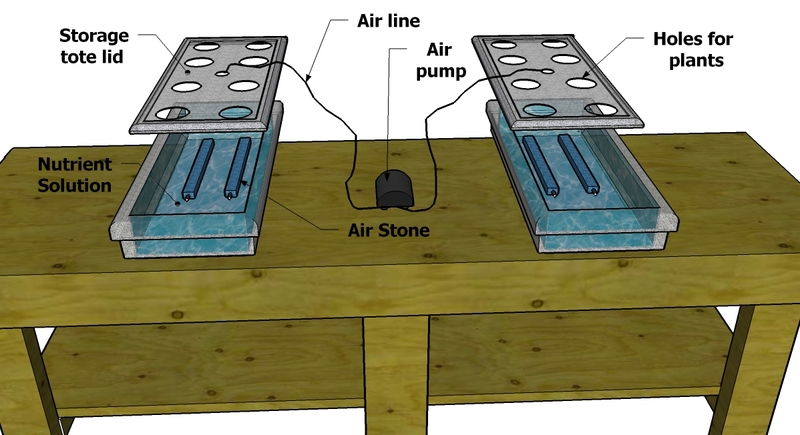 When deciding on an air pump, the more air bubbles the better in general, just keep in mind that if you add more air stones it will space out the distribution of the bubbles, but there will be less air bubbles coming out of each stone. 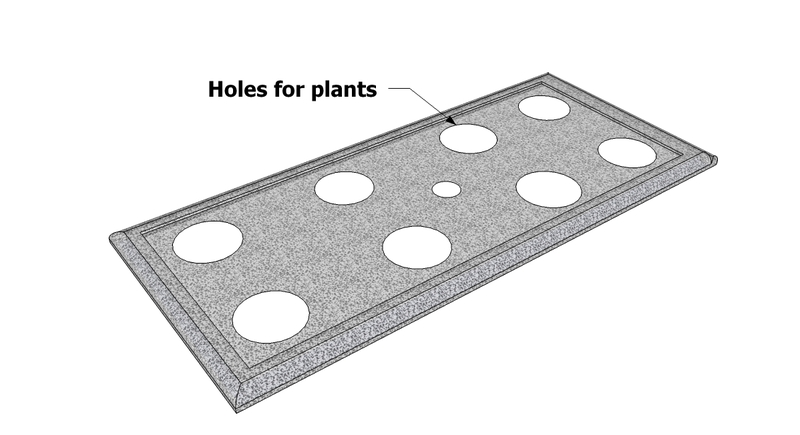 Now measure and cut the 8 holes for the 3 inch net pots that will hold the plants. Make sure you don’t cut the holes to big or the net po ts will fall through the holes. It’s better to cut them too small, you can always make it bigger if needed. Now lay some newspaper down and place the lid on it top side up, and place the storage tote bottom side up. Paint both black, painting them black will block any light from getting inside the growing chamber. You’ll want to block the light because that will keep any algae growth down. Make sure you only paint the outside of the container, if you paint the inside it will contaminate your nutrient solution. Let black paint dry completely. Now paint them again, this time with white paint. The white paint will reflect light. This is important because it helps to keep the nutrient temp down, as well as the temp of the root zone. Nutrient temperatures is very important to your plants health, so you will want to get all the help you can against high temperatures. Now make a small hole in the center of the lid, large enough to run the flexible air line through it. Place the air stone/s at the bottom of the growing chamber (storage tote) where you want them. 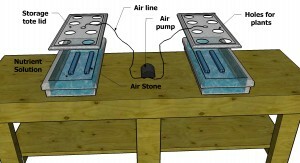 Then connect the air line to the air stone/s, and run it through the small hole you made for it in the lid. 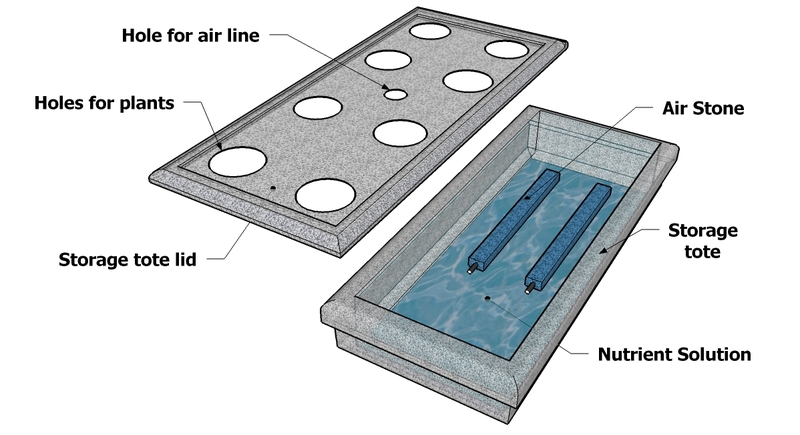 Then firmly connect the lid to the growing chamber and connect line from the growing chamber to the air pump. If your using more than one air stone per air line ,simply use a “T” connector to split the line into to lines. Now you are ready to fill growing chamber (reservoir) with the Hydroponic Nutrients. Fill it until it reaches about 1/2 inch above the bottom of the net pots. You’ll want the growing medium to be able to wick up the water, but not be fully submerged. By letting just the bottom of the baskets touch the water the growing medium will be able to get plenty of water, and allow the roots to get the air/oxygen they need also. 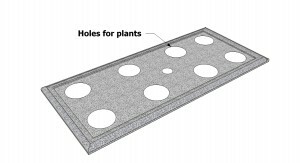 Now fill the net pots with the growing medium and plants, then place net pots in the holes you cut for them earlier. Make sure the container is sitting level so the water level will be level, then turn on air pump on and watch your plants grow. 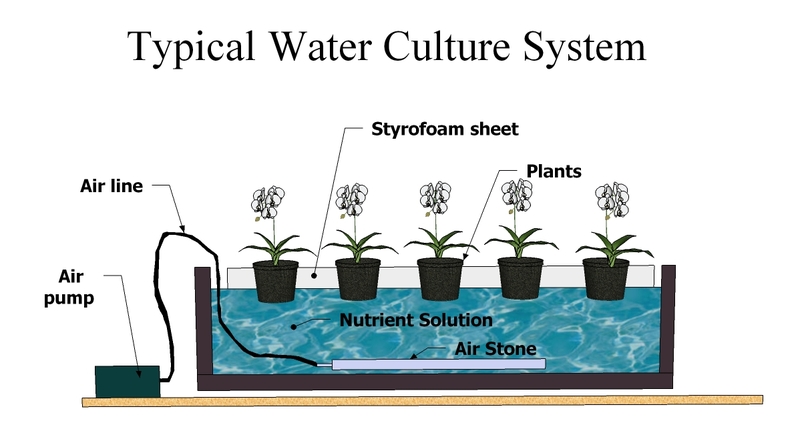 Lettuce plants do very well in this type of hydroponic system. 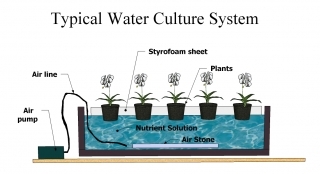 Pretty much any water loving plant that wont get too top heavy will do well in it. Here is a picture of the the same system, but with only one growing chamber. It’s growing butter king lettuce. About 2 months before this picture, they were just seeds.